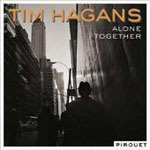 Alone Together reunites trumpeter Tim Hagans with pianist Marc Copland's longstanding trio for Hagans' second recording on the German Pirouet Records. The veteran collaborators previous quartet project, Beautiful Lily (Pirouet, 2005), featured a similar line-up with bassist Drew Gress and drummer Bill Stewart; this session includes Copland's regular drummer Jochen Rückert in Stewart's place. Where Beautiful Lily contained a number of Hagans originals, the majority of tunes on Alone Together are penned by Copland, with a handful of standards to round out the program. 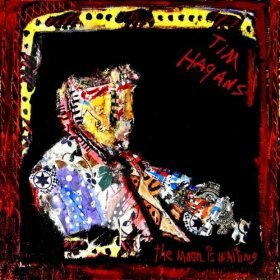 Copland's sophisticated mainstream writing and inventive reinterpretations of standards make him an ideal partner to Hagans, whose own career has skirted the sidelines of tradition. A straight-ahead hard bop stylist with a liberal approach, Hagans full-bodied tone, elastic phrasing and fertile lyricism have served him well since his early days with Stan Kenton's big band in the 1970s on through his drum 'n' bass experiments with Bob Belden in the mid-90s. While Beautiful Lily was celebrated for its dulcet sensitivity, Alone Together generates some heat, with Hagans provoking Copland to greater depths of passion than the introspective pianist is generally known for. The album opens with four Copland originals, which traffic in adventurous post-bop, while the remainder of the session is comprised of re-harmonized standards. The swinging title track, "You Don't Know What Love Is" and "Stella by Starlight" resonate with sublime lyricism, the later two offering haunting reinterpretations of timeless chestnuts. The quartet's nervy forays on Copland's four originals share more than a passing similarity to Miles Davis' classic second quintet (with Wayne Shorter, Herbie Hancock, Ron Carter and Tony Williams). Emboldened by Hagans' assertive attack, the quartet expounds on Copland's oblique harmonies and enigmatic themes with understated fervor and plangent expressionism. The opener, "See You Again" roils with simmering turbulence, recalling Davis' legendary combo from the very first bar. "Sweet Peach Tree" and "Over and Back" navigate angular contours and elliptical intervals while "Not Even the Rain" lilts with bittersweet euphony. Despite the obvious stylistic nods to Miles Davis' second quintet, Hagans and company deliver adventurous mainstream jazz with heart and soul. Alone Together may not be cutting edge, but what it lacks in visionary concept, it makes up in expressive potential. Track Listing: See You Again; Not Even the Rain; Sweet Peach Tree; Over and Back; You Don't Know What Love Is; Alone Together; Stella by Starlight. 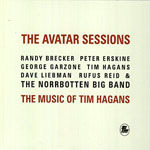 Personnel: Tim Hagans: trumpet; Marc Copland: piano; Drew Gress: bass; Jochen Ruckert: drums.